There's a photograph from 1966 of Marianne Faithfull performing on "The Tom Jones Show", in which she wears a purple and silver metallic knitted mini dress and a pair of silver metallic, square toed, block heeled Mary Janes. I absolutely adore Marianne, she's one of my biggest style inspirations and this outfit is one of my all time favourites from the sixties. 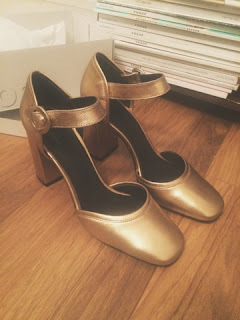 I've found that recently I'm a total magpie when it comes to metallic shoes and have continually held those Marianne Mary Janes as the goal for what I'm looking for. This season has not disappointed with footwear and I've definitely got one step closer to owning my Mary Jane shoe collection of dreams. I am totally in love with this seasons Orla Kiely for Clarks collection, with one shoe in particular calling out for me to buy them immediately! The angelic Angelina shoe! Gold metallic leather Mary Janes with a tiny weeny heel, 2 strap fastening (worn crossed a la Marianne) and a subtle nod to Orla's signature flower design on the front. 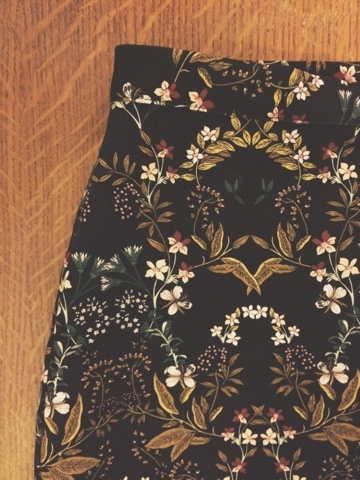 Wear with your favourite vintage dress and you're good to go tinkle toes. As if I didn't already feel like my Mary Jane dreams had come true, Topshop went and brought out these absolute beauty's and well I had to have them too (My poor bank account). 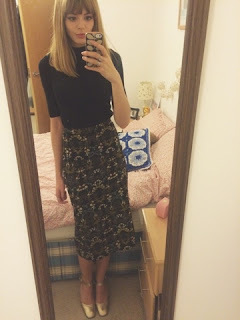 Higher heeled, square toed (aaahem, hiya Marianne dream shoes) and a little less of ostentatious gold leather then the Orla Kiely's. 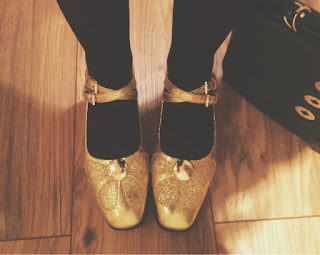 How I wore these little golden dancing shoes? I teamed them with this be-a-utiful floral midi wrap skirt also from Topshop. I LOVE the pattern on this skirt, it's a little bit vintage, a little grand, a little bit Gucci-esque and a little bit oriental.